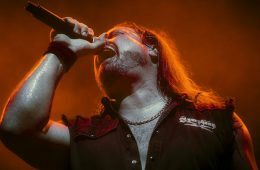 Brazil's Wikimetal podcast recently conducted an interview withADRENALINE MOB and SYMPHONY X vocalist Russell Allen. You can now listen to the chat using the SoundCloud player below. On whether they knew drummer Mike Portnoy was leaving ADRENALINE MOB before Mike released a statement announcing his departure: Russell: "Of course we knew about it before he made it public. He's been, obviously, real busy with THE WINERY DOGS, which is his next band that he's doing. The truth of it is we wanna keep working, we wanna keep doing ADRENALINE MOB and we don't wanna wait around for Mike to have the time [to put into ADRENALINE MOB]. And he doesn't know when he will have the time again, so that's really what's going down. Mike Portnoy was asked to be in the band by myself. Me and [guitarist Mike]Orlando had already written all the material, so [ADRENALINE MOB's debut album] 'Omertá' was completely finished before Mike joined the act. And it's a bummer, but he's got his sights on other things, and he's not gonna stick around. So we wish him the best of luck, but the MOB's gotta go on." 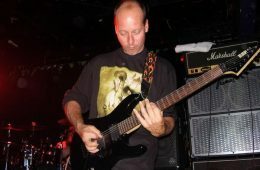 According to Tri-County Sun Times, former OBITUARY, SIX FEET UNDERand MASSACRE guitarist Allen West was arrested at the end of March in Lake Panasoffkee, Florida for methamphetamine production and possession. After the musician called 911 to report that two males broke into his house, "[responding] deputies met with the property owner Allen West in a wooded area next to the residence," the web site reports. "Allen Weststated that two male subjects forcibly entered his house by kicking in the front door at which time he fled out the rear and hid in the woods.